Hundreds of Thousands Protest in Tehran Accusing Ahmadinejad of Stealing Election; Guardian Council Orders Partial Recount | Democracy Now! AMY GOODMAN: Our top story of the day is Iran, where protests against Friday’s election results continue for the fourth day, and the powerful Guardian Council says it’s ready to hold a recount of disputed votes. The announcement follows a mass rally Monday in Tehran of several hundred thousand people who defied an official ban on a public rally to protest the election results. Iranian state radio reports seven people were killed at the rally. The radio report said the shootings were a response to, quote, “several thugs [who] wanted to attack a military post and vandalize public property.” The first confirmed fatality took place when shots were fired late Monday evening at what had been a largely peaceful rally. Photographs from the scene show one man dead and others injured. Iran’s paramilitary group known as the “Basij” are reportedly responsible for the shootings. Unconfirmed reports of widespread repression and additional fatalities suggest more people might have been killed in the days since the election, including five students at a Tehran University dormitory and seven demonstrators in the southern city of Shiraz. President Obama said Monday he was “deeply troubled” by the violence but would continue to pursue “tough direct diplomacy” with Iran. He also addressed the protesters in Iran. PRESIDENT BARACK OBAMA: What I would say to those people who put so much hope and energy and optimism into the political process, I would say to them that the world is watching and inspired by their participation, regardless of what the ultimate outcome of the election was. AMY GOODMAN: Monday’s demonstration has been described as the largest since the 1979 revolution thirty years ago. It stretched for five-and-a-half miles, and crowds thronged Tehran’s central Azadi, or Freedom, Square for over five hours. Defeated presidential candidate Mir Hossein Mousavi briefly addressed his supporters, calling for new elections. According to the official results, Mousavi won 34 percent of the vote, but President Ahmadinejad won 63 percent. On Monday, Iran’s Supreme Leader, the Ayatollah Ali Khamenei, ordered the Guardian Council to investigate allegations of fraud. Well, for the latest news from Iran, we go to Tehran. We are joined right now by Nahid Siamdoust. She is a TIME magazine correspondent in Tehran. Welcome to Democracy Now!, Nahid. Tell us what’s happening there now. NAHID SIAMDOUST: Amy, today they — Mousavi had again called for his supporters to meet at this Vali Asr Square and, in fact, at this huge demonstration yesterday, which saw something more than about a million people gathered together, as you said, around Azadi Square. They were passing on this message to each other to gather again today at 5:00 p.m. And one of their slogans was, you know, unless our concerns are addressed, this will be going on every day. But then the government, it appears, has been trying to, you know, basically interfere with those plans by calling for its own demonstration at 3:00 p.m. at the same location. And about 4:00 p.m. today, state television announced that now supporters of all four candidates will be gathering at Vali Asr Square, which is where Mousavi supporters were supposed to meet at 5:00 p.m. And right now there’s confusion, basically. Mousavi supporters are staying away, because they feel that the state is basically trying to use their presence to show — you know, basically take advantage of their presence for their own support, showing them to be as part of their own supporters. And so, some Mousavi supporters have gone down to Vali Asr Square, because the news just got to them too late. And those who know now, they’ve stayed away. And so, right now there are already large masses of people gathering around Vali Asr Square, but it’s unclear exactly who they support. AMY GOODMAN: And what do you know about the killings yesterday, last night, and also possibly over the weekend? NAHID SIAMDOUST: Well, you know, the killings started, in fact, on Saturday, because the street clashes and rioting, but obviously no news of any of those deaths was broadcast or published anywhere on Saturday, because they were all eyewitness reports. But as soon as rioting started Saturday night, it got really violent, already on the first day of the clashes. And riot police, as well as Basijis, dealt really, really heavily with demonstrators and protesters, who were gathered in smaller pockets around town, as opposed to the huge demonstration yesterday. And at least one person is confirmed dead as of Saturday — I mean, for the day of Saturday. And then, on Sunday again, there, you know, sporadic reports of people being killed in these clashes across town. 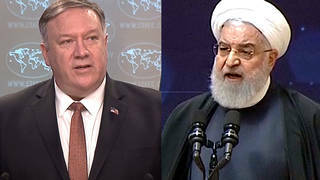 But then, yesterday, for sure, five students are reported killed by the attack of Basijis on the Tehran University dormitories, and anywhere — you know, probably more than seven people dead across Iran. You said seven people in Shiraz. We know of seven people killed in Tehran in the clashes yesterday. So, the government has been really shutting down many means of communication, the internet, pro-Mousavi sites, text messaging. So information is — information channels are blocked, and it’s hard to know exactly how many people have been killed. AMY GOODMAN: Nahid, explain — who are the Basijis? NAHID SIAMDOUST: The Basijis are a paramilitary group. You know, in the wider sense of the word, Basijis are something up to, you know, perhaps even 20 million of Iranians. These are people who are active in mosques, who do good work, who do voluntary social welfare type of work. But a very, very small minority of the Basijis, who call themselves Ansar-e-Hezbollah, the followers of Hezbollah, they also bear arms, you know, batons and sticks and chains and so on. And it’s this minority of, say, you know, 200,000 to 300,000 paramilitary Basijis that the state can mobilize to come to its support when it needs them. So, for example, ten years ago, with the student uprising, the Basijis were called in, and the killings at the Tehran University dormitory happened through the hands of — at the hands of the Basijis. And again, these past days, the level of violence I’ve seen handed out by Basijis has been far greater than what I’ve seen coming from the riot police, who are also extremely violent with, you know, all the gear that they have. But the Basijis, they’re just going at it, because they don’t really have any — what’s the word? They don’t really have to answer to anyone. AMY GOODMAN: Nahid Siamdoust, trying to follow the certifying of the election and then saying the recount, you had, right before the major protest, the Supreme Leader Ayatollah Ali Khamenei abruptly reversing course, promising an investigation to allegations of election fraud. He had actually blessed Ahmadinejad’s victory. You have the Guardian Council certifying the election and now saying they will recount in some places. Can you explain what’s happening there? NAHID SIAMDOUST: Yeah, Amy, based on election law, the Guardian Council is in charge of investigating any charge, any claims, anyway. So Khamenei coming out and saying that was more symbolic than anything else, basically because he had condoned the — because he had confirmed the election. But coming out and saying “I’ve put in a special request based on Mousavi’s letter for the Guardian Council to pay close attention to those claims, you know, with precision and so on” really showed that the state had understood that these claims and grievances over election fraud weren’t just coming from a small group within Iranian society. And I think that realization came after a few days of protest, because what the government had been saying so far is — and, in fact, Ahmadinejad, in his acceptance speech, referred to the people in the streets protesting as, you know, brushwood and motes, or weeds and grass, and, you know, basically these aren’t really part of Iranian society; these people just want to create chaos. And I think yesterday they understood, at least —- although the Supreme Leader made that statement before. And through the days, you know, from Saturday on, they had seen the masses of people. But certainly yesterday, with that demonstration of more than one million people and the helicopters hovering above and just sizing up the crowd, I think they’ve got a notion of this being a much, much bigger movement and much bigger claim. And so, they’re trying to address them. However, Mousavi today said that he wasn’t -— he didn’t really have much confidence in the Guardian Council, you know, doing a proper job and addressing this, because the Guardian Council is suspected by many of having been involved in what is now being described as election fraud. AMY GOODMAN: What you expect to see later today, Nahid, and tomorrow, and the level of clashes between pro- and anti-Ahmadinejad forces, or pro-Mousavi and pro-, well, current president Ahmadinejad? NAHID SIAMDOUST: I mean, the situation is one of — has been one of total chaos. Yesterday’s demonstration was absolutely peaceful. And, you know, the demonstrators, who don’t really have much of a civil movement, civil society movement type of education here in Iran, because that hasn’t really existed in these — you know, in this kind of — to this extent, but they were very disciplined, in fact. You know, people were very aware not to say any slogans that would insult anyone, including the leader, Ahmadinejad. The only slogan that was allowed was “Allahu akbar,” “God is great.” And, in fact, the only way they showed their protest was by raising their hands and their arms. So that demonstration itself was very peaceful. But then, as darkness came and, you know, dusk fell, the Basijis moved in, and that’s when the clashes happened, and that’s when we heard reports of people being killed. Today, the situation could get a little more even out of control, because, you know, you had Mousavi supporters who were expecting to be at the square, shortly before the government then also announced its supporters to show up at the same square, and you can be sure that there are going to be, you know, Basijis, who’ve come in — by the way, Amy, many of these Basijis have come in on motorbikes from cities and towns around Tehran. Many of them are not even from Tehran. And they’ve come in specifically for the purpose of helping the special forces. In fact, I’ve seen many of them carrying, you know, shields and batons and helmets that are clearly handed out to them by the police. And I can imagine, if you have supporters of both sides gathering at that square, unless they’ve been specifically ordered to keep the peace, I can see many more clashes happening today. AMY GOODMAN: And finally, Nahid, your own safety, how are you getting around and reporting? NAHID SIAMDOUST: I mean, Ahmadinejad basically claimed foreign journalists or journalists working for foreign publications as being the root of the evil, as being the ones who are instigating this conflict. And so, all of the foreign — my colleagues and all of the foreign journalists that I know here, we’re all keeping a low profile and, you know, not taking out any notepads, because a lot of us take notes in English, as opposed to in Persian, and, you know, just keeping a low profile, being part of the crowd, as opposed to standing out, you know, striking up conversations, telling people that we’re journalists when we ask them questions but keeping it quiet. And, you know, in these clashes, it’s been dangerous, because they’re street riots and clashes, and they don’t make a difference between, you know, the person who’s protesting and the journalist who’s trying to observe the situation. So, you know, I’ve been getting a few hits, as well, but that’s just part of observing the scene. AMY GOODMAN: Also, I thought it was interesting, southern city of Shiraz, where a lot of conflict is, isn’t Shiraz where Valerie Jarrett, President Obama’s top adviser, was born? While, you know, she is a powerhouse in Chicago — that’s how she came to know the Obamas — her parents, James Bowman and Barbara Taylor Bowman, were Americans who were teaching at the University of Shiraz, and that’s why she was born there. NAHID SIAMDOUST: Hmm, interesting. Well, Shiraz has been a, you know, generally — is known to be a generally liberal city. But it’s not just Shiraz where the — where clashes have been taking place. We’re getting reports from — and again, this is all nonexistent, basically, on national means of communication or television or anything, but all the reports that we get, the sense that we get of what’s happening in other towns, is all through, you know, having relatives and friends in different cities. And, you know, in Tabriz, there have been widespread clashes. That’s where Mousavi is from. In Esfahan yesterday, there were, you know, widespread clashes. Apparently at the Caspian, there are many clashes in the south. So there are clashes and protests taking place across the country. But state television — I mean, if you were to just watch state television, which is the only means of news for the majority of Iranians right now, especially because they’ve also jammed satellite broadcast, you’d think that what’s happening is really just a bunch of, you know, troublemakers setting buses and garbage bins on fire and basically damaging public property. And that’s the sense you’d get. You’d have no idea that there are widespread protests going on, many of them — most of them peaceful, across the country. AMY GOODMAN: Finally, I’m looking on Facebook at sites calling for cyberwar on the Ahmadinejad government. NAHID SIAMDOUST: Well, yeah, Facebook and other social networking sites, including Twitter, have been instrumental to what’s been going on, because a lot of the — you know, a lot of the sort of communication, as far as internet, has been working — and again, that’s been sort of hampered lately, as well — has been going on at least prior to the election. A lot of the organizing was going on through these social networking sites. And they’ve sort of taken on the role that the cassette tape had during the Revolution. That’s how the message was being passed on, you know, during the Revolution, through cassette tapes that were recorded here and there and then multiplied and distributed around town. And whoever has access to Facebook, you know, will receive those messages and call up their friends, because some people have better internet connections. Some people are able to actually break those filters. Not everyone can. And those have become sort of a port of communication to a wider tree of people. AMY GOODMAN: Nahid Siamdoust, thank you very much for being with us, TIME magazine correspondent in Tehran. Thank you for updating us and be safe yourself.